Thank you everyone for the amazing support we've received after the inaugural edition. A shoutout goes to Neil Murray, whose Series F newsletter on the future of VC inspired us. We will be experimenting a bit with the format of the newsletter, so feel free to respond saying what you like and dislike. This week we try to add a bit more opinions, and thus this might feel a bit more like a blog post than a bunch of links. What a week in the Token Economy, folks! A few high profile ICOs brought the Ethereum network to a halt, while a flash-crash on GDAX ETHUSD book took ETH price down to $0.10 in seconds and some serious questions were raised on the code of a project that raised c. $150 million only a week ago. These events are clear signs of the inevitable growing pains of a fast moving ecosystem. The great thing is that lessons get shared and spread widely and the bar gets raised every time. Let's dive right into it, but only after you've read Naval's tweetstorm. What a magic example of a clear and genius mind. 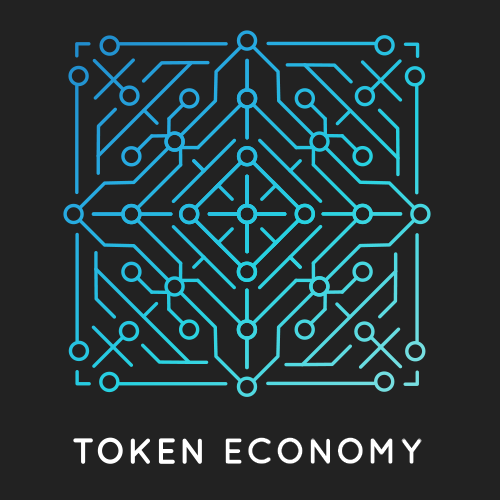 As we explore the whole new world of the token economy, we'll find many new concepts and ideas. Some seem minor and some bigger. One that seems major to me is the concept of public scrutiny of a company's (or maybe a project) developments. This week we've seen this in action with some back-and-forth between public analysts and the company itself, when Bancor responded to some dissents on its model and ICO. Emin Gur Sirer started with a 29-points Bancor takedown. To which the company responded with a point-by-point rebuttal. Then, Udi Wertheimer published his Bancor Unchained: All your tokens are belong to us warning (albeit a bit late) to which the company granted an additional ad-hoc response. Whatever opinion you form on the Bancor protocol and project from the above articles, I think it's worth comparing this MO with the traditional "get yourself in a garage" startup model, especially with the latest "let's try to never get public" attitude that the latest unicorns are adopting. In the token space, projects and companies are constantly being judged on their actual code and release schedule. This is even more impactful than the traditional equity public markets, where analysis is often based solely on the companies' quarterly revenue figures. It will be fascinating to see how much of the actual usage metrics will be open and how both companies and investors will adapt to this new world. Absolutely perfect explanation of the problems created by coupling speculative and utility value in the same token. Must read. A reddit user created some smart contracts to help people participate in ICOs. - A user sends some ETH to the smart contract. - When the ICO is over, the user can then send a 0 ETH transaction to the contract and can redeem his tokens. A sound list of aspects to look at when evaluating a token from a former VC. All these ICOs have not only raised money, but quite a few eyebrows too. And now the NYT steps in with a well written reporting piece. Many European VCs are getting interested in tokens. Here's a take from a traditional SaaS investor on platforms like Steem. Demand for ICO tokens does not seem to diminish. This above is a chart tweeted by Myetherwallet a few hours after the Status ICO started, it shows number of transactions originated via their wallet per hour. The Ethereum network came to a complete halt, lots of frustrated users wasted hours and gas as many services stopped withdrawals or transfers of ETH while the network cleared backlog. Status ended up raising ~$90M for its ICO, and the whole dynamic ceilings concept utterly failed to provide a good experience for buyers and ETH users everywhere. At the same time, Civic raised $33M with a much more thoughtful and elegant approach. In a blog post the founder explains how Civic optimized for network success. Omise didn't even get to do its ICO as it went way over its target in a pre-sale. SONM raised $42M and that's almost not news anymore. 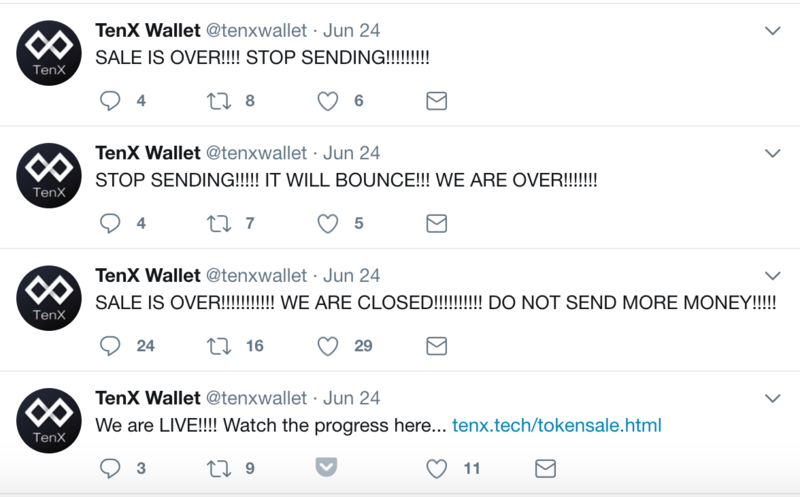 And obviously TenX, which raised its 200,000 ETH (~$60M) hard cap in something like 7 minutes for yet another payment card. I will leave you with an image of the TenX twitter feed, which I think reflects well enough the madness going on on all sides. Alex Kontegna presents his take on why AdToken is one of the few ICOs that actually make a lot of sense. EOS explains its ICO model where 20% of the tokens will be distributed during the first 5 days and the rest will be distributed in equal increments every 23 hours thereafter. A P2P Decentralized Energy Market. Openbazaar announces it's v2 and it's damn cool, particularly that it will run on InterPlanetary File System (IPFS). The ETC ecosystem will get a boost later in the year with the release of the Emerald trustless wallet and Dapp SDK. After Kik announced its plans to launch the Kik token, and Numerai released its own NMR, VC-backed esport bookmaker follows suit with the planned ICO of its own ERC20 token Unikoingold. We will see more of these. An attempt to fix token sales with proof of qualia. 👔 JOBS: Visa and Booz Allen Hamilton are both in the market for Blockchain engineers with Ethereum experience. Visa has been actively looking at the blockchain to facilitate international B2B payments (partnering with Chain). The IMF continues to be very aware of the impact that digital currencies and distributed ledger technology can have on legacy financial systems. Particular focus is given to cross-border payments and potential for central bank-backed digital currencies. First ever mention of 'digital token' by the IMF. Well worth a scan through (DOWNLOAD). This is very significant as it's the first real test of its kind by a central bank anywhere in the world. The idea of central banks issuing digital currencies pegged to the national currency is intriguing with clear benefits in terms of costs, accessibility and traceability, as well as facilitating cross-board transactions. It's still unclear though how they would interoperate with existing open-source crypto currencies. Sometimes called "China's Ethereum," Antshares rebrands as Neo and lays out its roadmap for the future of blockchain tech in China. On Wednesday evening a 'whale' wiped out the GDAX ETHUSD order book with a large (est. c. 100k ETH) at market sale order, which itself trigger a series of stop losses on long positions and automatic liquidations of margined positions. In less than 30'' ETH price cratered to $0.10 where a few lucky bottom fishers got their buy orders filled. GDAX has since issued two statements, the latest of which announced that all forced sellers who lost money in the flash crash (because of stop losses and margins calls) will be made good by GDAX itself. 3. GDAX technically didn't have to bail out the traders who lost money and this sets a dangerous precedent in the industry; for a company whose customer service is often criticised, this seems to be an opportune marketing stunt to avoid losing existing customers while attracting new ones from other exchanges who may perceive GDAX as being 'safer' now. 4. It will be interesting to see what GDAX and other exchanges do to develop solutions to actually prevent similar occurrences in the future. There are talks of exchanges merging their liquidity pools so that everyone benefits from increased market depth, but there are plenty of other lessons to be learnt from the financial markets. Citing surging demand for graphic cards from cryptocurrency miners in China and Eastern Europe, $NVDA research analyst reviews its stock ratings upwards (share price already up +55% YTD). $NVDA and $AMD stocks are considered a 'play' on crypto. The recently released token of decentralised VC-backed hedge fund Numerai hit Bittrex on Friday and has since more than doubled in price on volumes north of $15 million over 24hrs. It's network value stands at $115 million, which presumably tops the valuation Numerai got at it $6 million Series A in Dec 2016 (of course, 'network value' and 'equity value' can't be compared, but it is still noteworthy to track who and how the value of a decentralised project accrues to). London-based provider of most popular Bitcoin wallet (+14 million) and blockchain platform announced their Series B round. Bravo! Clear example of a European company leading in this space. If you have an interesting deal, idea or article please send it over! If you enjoyed reading this, please forward it to someone who you think would enjoy it too.